I enjoy art, and I enjoy having pretty things in my home; I've also been known to spend a bit of cash updating my home accessories to keep my apartment in the latest style. This is why I LOVE my chalkboard wall - a wonderful reusable canvas that allows me to change the artwork in my home on a regular basis. It's the perfect home accessory for this fickle fashionista. 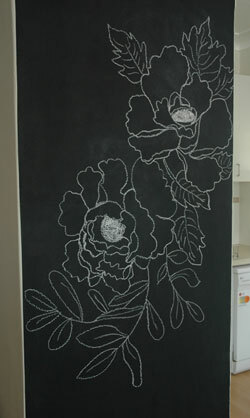 Okay, I'll admit the chalkboard paint itself was not environmentally friendly - those VOCs could have been detected from two blocks away, and the clean up was extremely difficult - but now that the wall is complete it saves me from buying new things for my apartment every few months because I can update the design whenever I feel bored. Here are some of my favourite pieces over the past couple of years. I'd love to hear from any artists who want to inspire my next design!